Dr. Edmund Hack, attending M.D. He was raised on the Ashland Avenue Airport, Chicago Heights and Governor’s Airpark, Richton Park, IL. 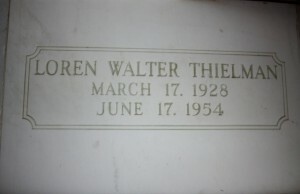 owned by his father, Walter L. Thielman. 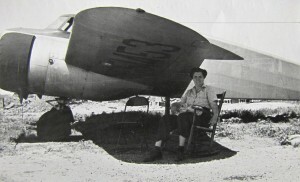 Loren became a skilled aviator. 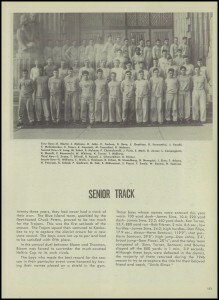 Graduated from Bloom Township High School June 6, 1947 and was a member of the Trojan track team and the Trojans Varsity Football team. Fanned by a stiff southwest wind, fire of unknown origin totally demolished a one-story frame office building early Friday morning at Governor’s Airpark on Route 54 near Monee. The airport is owned by the Midwest Aircraft corporation, of which Walter Thielman, 1320 Franklin Avenue, is president. Formerly known as the Chicago Heights Airport and located on Ashland Avenue near Country Club Road, its name was changed when the equipment was moved last year. The blaze gained considerable headway before it was discovered and efforts of the Richton Park fire department and volunteers from nearby homes who responded to the alarm failed to save the building, which was burned to the ground by two a.m. The exact time at which the fire started is not known, but persons who drove by the airport at 12:15 a.m. Friday declared that they saw no sign of fire. Another passing motorist noted the flames at 1:30 a.m. and rushed to a telephone to summon the Richton Park department. 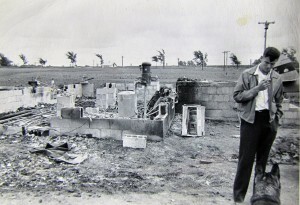 Destroyed in the blaze were desks, typewriters, flying records and office equipment. Plans to build a new structure are being made by the aircraft company, a spokesman said. The razed building is the one which was used for an office when the airport was located in Chicago Heights. Authorities at the airport did not place an estimate on the loss. 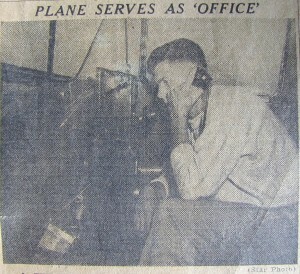 Temporary office quarters were set up Saturday at the airport in a twin-engine Cessna airplane, in which a telephone was installed and a typewriter table placed. The same southwest breeze which helped the flames was instrumental in saving two hangers in which several planes were housed. Located southwest of the office, the hangers were some distance from the burning building and were never in real danger. Thielman moved to the new location last year. Operating at the Ashland Avenue port on a month-to-month lease, he was forced to move when the lease was terminated by the owners of the land. 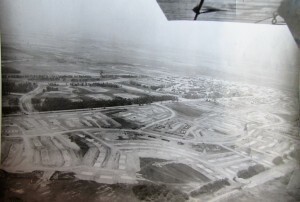 The rapid development of Park Forest, planned city southwest of Chicago Heights is shown in this aerial photograph by Harold Bisig, who was taken aloft from Governor’s Airpark by Loren Thielman. Light planes swooped in steadily Saturday on Chicago’s “front door” airport after Friday’s opening. A half dozen landed at the Northerly Island air terminal in Saturday’s first hour of operation. Among them was one piloted by Prof. I.A. Andrews of the University of Illinois ceramic engineering department. He flew in from Milwaukee for morning conferences here before departing for his home in Champaign in the afternoon. “This is really convenient,” he grinned. Loren Thielman of the Gary Steel and Supply Co. flew in from Chicago Heights to pick up the firm’s president, I.A. Ruder. The airport operates only during daylight hours. At its official opening Friday, 179 light planes landed there. Cancer patient Carl Krueger, Triumph, was flown in this flying ambulance from Triumph Airport to a Chicago hospital last Saturday in an effort to save his life. He was transferred from the local hospital when a Chicago physician, Dr. George Franklyn Smith, thought that he might be able to help the young Tri-Mont farmer. 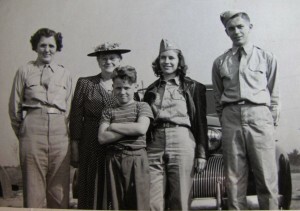 Seen here loading Krueger into the plane are ambulance operator Elmo Stockdill, Dr. J. J. Heimark and Mrs. Lowell Hoeimer, nurse who accompanied Krueger on the flight. 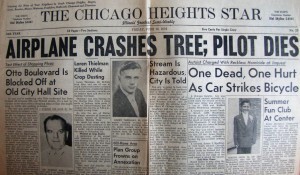 The plane, a Cessna 170, was flown from Chicago by Pilot Loren Thielman of Chicago Heights. 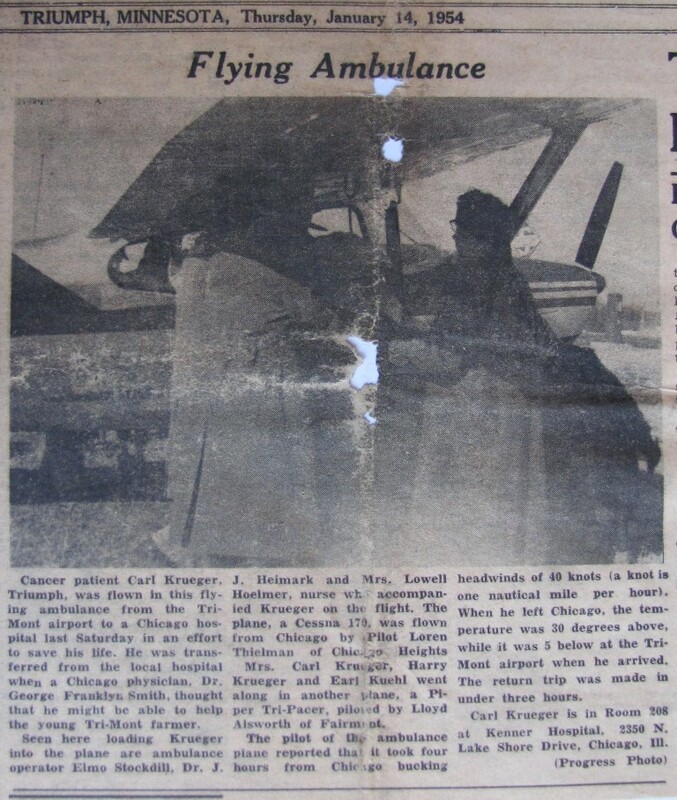 Mrs. Carl Krueger, Harry Krueger (cousin) and Earl Kuehl went along in another plane, a Piper Tri-Pacer, piloted by Lloyd Alsworth of Fairmont. The pilot of the ambulance plane reported that it took four hours from Chicago bucking headwinds of 40 knots (a knot is a nautical mile per hour). When he left Chicago, the temperature was 30 degrees above, while it was 5 below at the Tri-Mont airport when he arrived. The return trip was made in under three hours. Loren Thielman, 26, Richton Park flyer and son of one of South Cook’s best known aviators and instructors, crashed his plane into a tree yesterday morning on an Indiana farm and died in the flaming wreckage. Thielman was crop dusting on the Charles Herz farm, 2 miles south of Indiana state route 2, near the Illinois-Indiana line. He crashed into the tree at 7:30 a.m., daylight savings time. 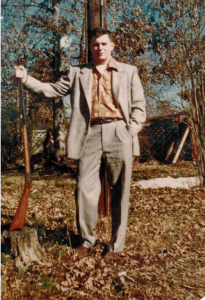 He was the son of Walter Thielman, operator of Governor’s Airpark, located on Governor’s Highway, Richton Park. He made his home with his parents at their residence at the airport. Also surviving is a brother, Leslie, who is stationed with the Army at Columbus, GA.
A spokesman at the airport said yesterday that Thielman was working for his father as a crop duster, a job he had been doing for the past three years. 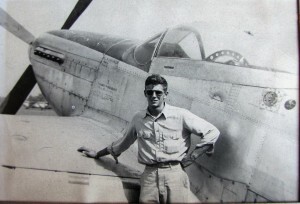 His plane struck a 40 foot tree, crashed to the ground and burst into flames. Indiana state police could give no reason for the crash, although they theorized that the mist from the crop spray may have obscured the pilot’s vision. There were no witnesses to the crash and police lacked details on the movement of the plane prior to the accident. A pilot dusting crops flies his plane at an altitude of less than 50 feet, often coming within a few feet of the ground. The victim was unmarried. 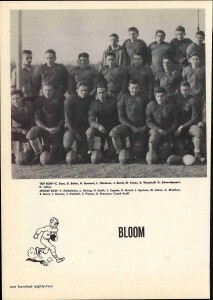 He attended Bloom Township High School as a youth and was a popular young man. Funeral services for the crash victim will be at 2 p.m. tomorrow at the Hack Chapel, Beecher. His body will lie in state today at the chapel. He was born March 17, 1928, at Hammond. 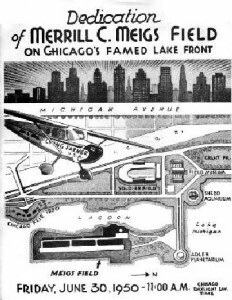 Before establishing Governor’s Airpark, the Thielmans operated the Ashland Avenue Airport in Chicago Heights for many years. The elder Thielman has developed many expert flyers, and both he and his son have been held in high regard for their skill as pilots. 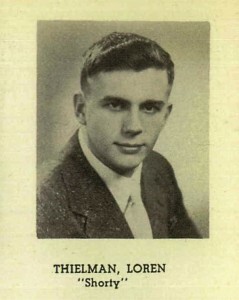 Loren Thielman, 26, a Richton Park flyer and son of one of South Cook’s best known aviators and instructors, Walter Thielman, operator of Governor’s Airpark located on Governor’s Highway, Richton Park, lost his life in the flaming wreckage of his plane, last Thursday, and was laid to rest in the Beecher Mausoleum, Saturday, following services at the Hack Chapel, Rev. Brauer of St. Paul’s Lutheran Church, Chicago Heights, officiated. Thielman was crop dusting on the Charles Herz farm, 2 miles south of Indiana state route 2, near the Illinois-Indiana line. His plane stuck a 40 foot tree, crashed to the ground and burst into flames. 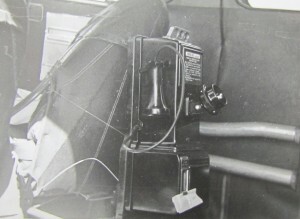 Several witnesses to the crash could give no reason for the accident, although it was theorized that the mist from the crop spray may have obscured the pilot’s vision. The victim, unmarried, was born March 17, 1928, at Hammond, Indiana. He attended Bloom Township High School as a youth and was a popular young man. He is survived by his parents, Mr. and Mrs. Walter Thielman of Richton Park, with whom he made his home, and one brother, Leslie, who is stationed with the Army at Columbus, GA.
Other, more distant family include: Bahlman, Batterman, Bergmeier, Beseke, Bielfeldt, Bohl, Cloidt, Dunlap, Engleking, Fenske, Fick, Fiene, Freerking, Frobose, Graham, Guritz, Hack, Hager, Haltenhof , Heine, Heldt, Hildeman, Hinze, Hoffman, Hoppensteadt, Horn, Hunte, Kaczynski, Kappe, Kilborn, Kirchhoff, Klocksieben, Koch, Langreder, Leder, Maass, Matthias, Mc Carty, Meyer, Monk, Niedert, Ohlendorf, Pansa, Peters, Pralle, Riley, Ristenpart, Rohe, Rust, Saller, Selk, Struve, Vagt, Von Engeln, Wegert, Wehmhoefer, Wiechen, Westphal, Wilkening. This entry was posted in Automated Burial Listing, Burial Listing, Burial Location, HEADSTONE, Obituaries- Have Full Copy, St. Paul's - Chicago Heights, IL by Sandra. Bookmark the permalink.